Find me an online slot gamer who doesn’t feel some sort of nostalgia when they play a game that features all the stalwarts of the traditional fruit machine scene and I’ll show you a bare-faced liar. 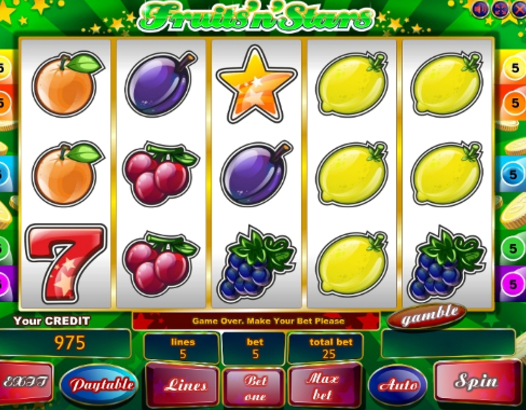 Fruits and Stars is a basic 5 reel for both amateur and experienced gamers filled with symbolic fruits and endless opportunities for cash rewards and free spin bonuses. Click to see UK slots today. Established in 2012, Playson is a Malta based online casino games developer. Still a new face to the industry, this young company has already become a leading developer. Their games are easily recognisable with their high definition graphics and hallmark technological innovation and features. They have over 30 online slot games out already which have given them their reputation as a premium casino gaming provider. With many more games in the pipeline, Playson is a brand to watch out for and you can play slot games on the internet now. Who doesn’t love the classic fruit machine? Isn’t that where most of the fun started? You are going to fall in love with this classic theme in Fruit ‘n’ Stars. In this online slot game, you have 5 reels, 3 rows and 5 paylines. Your goal is simple and as classic as the fruit machine: gather the winning combinations of this harvest and receive your prize! In this online slot game, you can set your bet at 1p up to £5. You can also choose yourself how many lines will be active in the game giving you more player control. Learn more about the best games you can play. On the reels you have your classic fruit machine symbols which will fill you with wistful nostalgia: the lemons, oranges, grapes, watermelons, cherries and 7’s. You’ve got the Star symbol acting as the Scatter which will reward you with multipliers if you can hit the right amount on your screen. You’ll have 3, 4, or 5 Stars anywhere on the screen to win 2x, 10x or 50x your stake! You have the Gamble Feature which means whenever you get a winning combination in Fruit ‘n’ Stars you’ll be given the opportunity to gamble your winnings and double up! You’ll be given a deck of cards to choose from, and you have to guess if the next card will be red or black. If you gamble correctly, you will multiply your original win by x2, you can even elect to gamble your winnings up to x5 if you’re feeling lucky! If you’ve ever played a Playson game you will know by now that there is always something special to be found. That something extra can be found in their special symbols. The Wild is the Lucky 7 of slots. 3, 4 or 5 of this combination will give you 100, 1000 and 5000 coins. Take your winnings home right away because there are no bonus rounds or features to tempt you further. 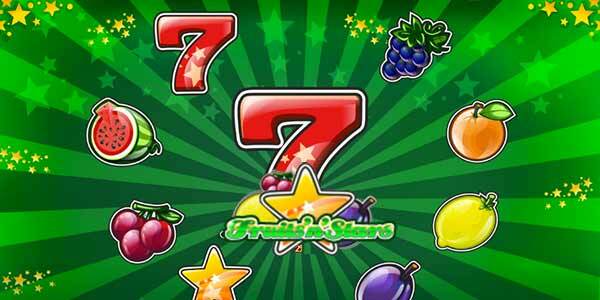 Fruit ‘n’ Stars is a classic 5-reel online slot game that does exactly what it says on the tin. You have a full range of vintage casino symbols which will attract traditional game enthusiasts. There is still good scope for high rollers to win impressive prizes in this game, and the simple game features will also attract newcomers who are trying out their first online gaming experience. This online slot game from Playson comes with all the charms of the retro fruit machine, from delicious fruit symbols to an upbeat soundtrack, this game is a great way to sit back, relax and have fun.